Human beings tend to take their bodies and mobility for granted. Until one day the aches and pains start, and we suddenly realize a simple act like walking, pain-free, isn’t something to be taken for granted. Ankle pain is associated with different conditions such as arthritis, a sprain or other injury, and any number of more elusive causes. While there are numerous medications your doctor may prescribe, often these come with their own nasty side effects like nausea, dizziness, or the exacerbation of conditions such as hypertension and digestive upset. This is why many people are now opting for more natural ways to treat their health issues. Here are 8 natural ways to extinguish your ankle pain. If you’ve suffered a recent sprain, reach for some ice. Why is icing an injury such an effective way to treat pain? Cold narrows blood vessels, which slows down blood flow. This results in a reduction of fluid buildup around the affected area. Ice is a simple and natural way to control inflammation and swelling and the associated pain. There’s no need to buy a fancy ice pack at your local pharmacy – simply fill a plastic grocery bag or gallon-sized Ziploc back with fresh ice and apply it to your ankle for 20 minutes. There is no need to ice for more than 20 minutes and, should the cold feel too intense, place a towel or T-shirt between your skin and the ice bag. Heat therapy is also a time-honored method of eliminating pain, though is typically used once the initial injury has been iced for a few days. Taking a warm Epsom Salt bath is one of the easiest and most relaxing ways to treat ankle pain. Epsom Salt – or magnesium sulfate – relaxes sore muscles due to a physical workout or strain from an injury. Often, when you’ve twisted your ankle, your muscles try and make up for the fact that ligaments and tendons have been injured. This causes additional strain and muscle tightness, which leads to pain on top of pain. You can either soak your entire body in an Epsom Salt bath, or fill a bucket – like one of those tall Home Depot buckets – with warm water and a cup of Epsom Salt. Coconut and garlic oil have been used for centuries to effectively treat numerous conditions. Coconut oil is great for treating everything from dry skin to digestive upset, hormonal imbalances and also aids with weight loss. Garlic oil is used by many to treat Candida, colds, ear infections and arthritis. Mix 2 table spoons of coconut and garlic oil in a microwave-safe container and heat in the microwave for 10 seconds to slightly warm the mixture. Generously massage the warm oil onto your ankle, gently working the oil into your skin for 5 to 10 minutes. Let sit for a few minutes, then wash your ankle and hands in warm, soapy water. 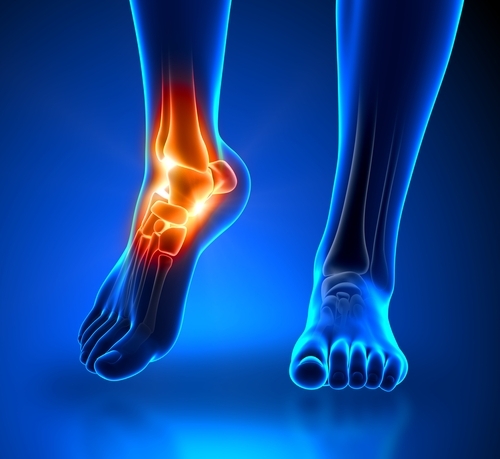 Often, ankle and knee pain is a direct result of carrying around excessive weight. Your ankles are a primary weight-bearing joint, and even just 10 extra pounds on your body can cause them to swell and hurt. Simply stated, losing weight can permanently end your ankle pain. Start by improving your nutrition. If you currently eat a lot of high-caloric processed foods, start swapping them out for nutritious, whole food options, focusing on organic fruits and veggies. Also, be sure to drink plenty of water to flush out toxins from your body. Staying hydrated is also a great weight to give your metabolism a natural boost. Exercise will help ease ankle pain in a couple of different ways. First, and most obvious, it will help you shed those extra pounds we just talked about. Second, exercise will also help to strengthen muscles and tendons and will prevent further injuries. Range-of-motion exercises in particular will increase your flexibility, loosening tightened soft tissue that result from sprains. An easy exercise to try: sit in a chair and, with one foot raised, trace the letters of the alphabet with your toes, moving the ankle as much as possible. Repeat with the other foot, and repeat the entire exercise 5 to 10 times each day. And finally, exercise is a terrific way to fight the inflammation and stiffness caused by arthritis. Whether you suffer from arthritis, have sprained your ankle, or simply suffer from chronic pain due to lack of movement, be sure to choose gentle exercises like walking for best results. Arnica is commonly used for healing and strengthening muscles and joints because of its ability to reduce swelling, pain and inflammation. As an added benefit, arnica also increases circulation and helps prevent bruising to an injured area. Simply dilute a little arnica oil with another carrier oil such as almond or olive, preferably in a 30:70 ration, then gently massage it into your ankle, wrap with a bandage and leave on for a few hours. Note: some people are sensitive to arnica oil, so be sure to do a patch test before using liberally. Also, never apply arnica, or any other essential oil, to skin that has open cuts. Fish oil is widely known for its anti-inflammatory properties, and inflammation is at the root of disease as well as pain. Taking 1200 milligrams a day of a potent fish oil can dramatically reduce, if not completely alleviate, ankle pain caused by arthritis. Tumeric is a root that is used in many spicy foods, particularly in Indian dishes. Research has found that this spice can bring significant pain relief. While you can cook with turmeric, your best bet is to take it in supplement form. No one should have to live with chronic pain, and no one should have to treat pain with pharmaceutical drugs that can cause further health issues. For this reason, we highly suggest you try these 8 natural therapies to relieve your ankle pain.